Our ticket stand is located on the dock at the Boardwalk restaurant in downtown Put in Bay. Parasailing is $80 per person. Flights are ten minutes and that's high or low, wet or dry. It's your pick. We open everyday weather permitting at 11:00 am. Reservations are taken in person on a first come first served basis or can be booked online. Try the deluxe package for $110 and get a T-shirt and video of your flight. It's a short ferry ride to the island and there's lots of things to do. Come and enjoy a great view of the islands as you soar above Lake Erie. It's fun and safe for all ages. See you soon at Put in Bay! We open daily weather permitting beginning at 11:00 am. Memorial Day weekend through Labor Day. 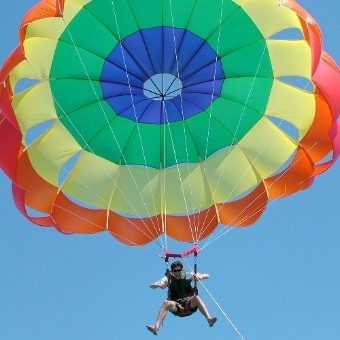 Put in Bay Parasail Get An Altitude Adjustment!